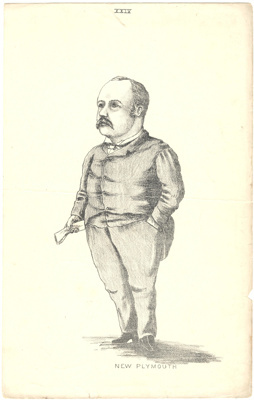 Pamphlet; entitled 'New Plymouth', featuring a cartoon drawing of Oliver Samuel, who is dressed in a suit and holding a paper document. The figure is depicted in half-profile. At the top of the page are the roman numerals 'XXIV'. Below the figure, the words 'New Plymouth' are printed. In 1884 Samuel became the local representative for New Plymouth, and was a vocal advocate for the politics of Sir Harry Atkinson.